I met up with the St. Louis Drawing & Painting Meetup Group at this month's Urban Sketching outing. 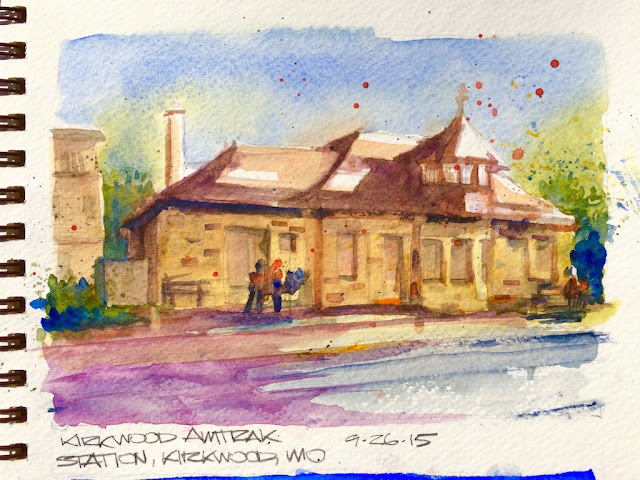 We sketched the historic and picturesque Amtrak train station in Kirkwood, Missouri. There were so many people out on this beautiful early fall morning; people walking dogs, shopping, and attending a nearby farmer's market across the street. Several trains (both freight and passenger) moved through the station area while we sketched; the freight trains operated at deafening levels and seemed to take forever to pass by. But very cool nonetheless. I had intended to substitute out a few paints in my kit (Quin Gold & Hematite Burnt Scarlet) before heading out to the event, but forgot in my haste to get out the door on time. Both of these pigments work well on my larger palette, but I feel that I like the weak opacity of a true raw sienna when I'm sketching on location, as I use it a lot for rendering stone, masonry, etc. I have been experimenting with Quin Gold as a substitute for Raw Sienna, but again, seem to be preferring the Raw Sienna.